i just started collecting the TCG. does anyone have anything to sell from the TCG? packs/boxes or maybe even a complete set/collection? I'd recommend contacting forum member Tirade. They have bought up a lot of extras over the years and might have some for sale. 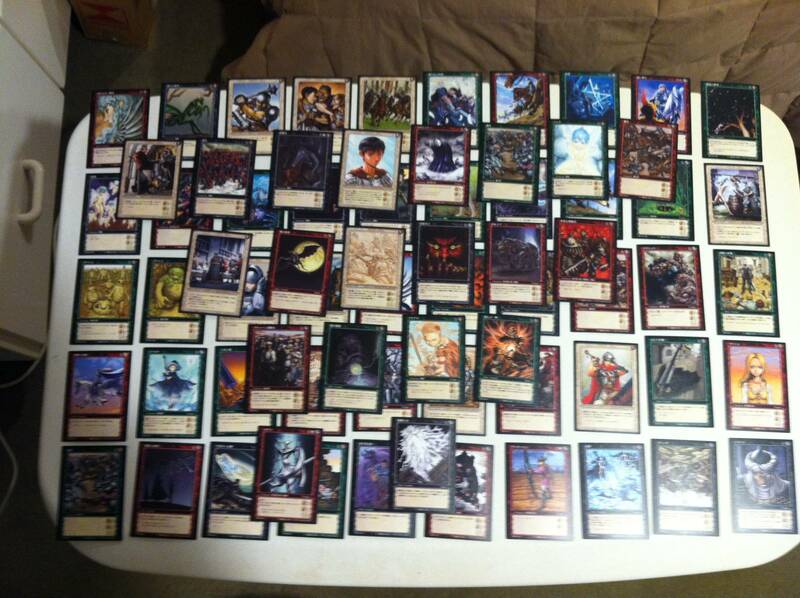 I bought a lot of the TCG from Tirade years ago. I think I cleaned him out actually. Yea I've got some and I'm missing a few! It's been awhile!! I'm glad to see the TCG being talked about again though! Where have you been buying the packs froms? hey guys thanks for the replys! @death_maiden i dont really have much yet, i got mine from a friend who had them lying around and needed the money (lucky me lol). i tried looking for more TCG stuff online but i cant seem to find anything at all i can literally find nothing to buy ._. Let me know if you find any packs/boxes online, so I can buy them before you do! In the meantime, I will go through my collection over the weekend and let you know what doubles I have. You can have them for free. also, haha yea if i would find anything at all do you sometimes find packs/boxes online? or where did you get your stuff? I haven't seen unopened packs/boxes for years. Guys like this pop up: http://sellinglist.auctions.yahoo.co.jp/user/terusui888?ei=UTF-8&b=51 - otherwise there's not a whole lot out there, sadly. Anyway, I will let you know tomorrow what I've got for you. I totally underestimated how many doubles I have! I live in beautiful isolation - better known as New Zealand - so you'll have to cover shipping (about $15-20 if you live in the States). If you're cool with that, shoot me a PM. I have a box of the TCG, if I remember correctly, as well as the Japan Toys R Us starter deck special. I may be willing to sell it all as a bulk lot. I'll dig it up from my storage of stuff if interested. The cards never saw play. They just sat in a box next to all my Genso Suikoden ccg notebooks. I'll buy these off of you if Whtieháwk's alright with that. i'd be quite interested aswell! how much do boxes and Decks go for anyway? since i havend found any i have no clue. I have myself a lot of cards for sale (mainly common and uncommon cards) if someone is interested, pm me a list of your needed I'll see if I can help. Rare find indeed at this point. What volume? I actually have an unopened Volume 2 box. It is for sale if anyone is interested. Boxes come with 24 packs. Should guarantee 6 holos. I have been on a long hunt for volume 4 stuff. That is all I need for the regular sets. Pretty resigned to never finishing my secret rare set of 72.
it's all new , made by a japanaese Berserk TCG collector, he put some pictures of cards I didn't know existed and has some for sale too. By the way if you still have some cards especially secret cards for sale I'm willing to buy. Very good site. I can certainly add to what he has. He could use a Miura autograph section. Also, im still on the hunt for set cards too. If he has any extras, I am interested. He told me I was the very first person to contact him (site was made in july 2016 after the new anime) and was very surprised there was a french Berserk TCG collector/fan. I told him I could help him with some cards pictures and maybe some people in skullknight.net could help too. Btw I have some of your missing bk4 parallel but they come from the vending machines boosters (6 cards in a package) and the holo effect is a bit different. So you have some volume 4 cards? That's awesome. I wasn't aware the effect was different. What's the difference? A holo is a holo to me. I may have bought some vending packs too, many years ago. Came in some black and white box. Thought it was some sort of promo. Oh, I see what you mean. I believe I actually have a Holo Griffith card from Volume 5 that looks like this. Always liked the look better, to be honest. But really, makes no difference to me at all. When you have been trying to complete sets for as long as I have, beggars cannot be choosers. Whats the card number you looking for? ?